As superhero cinematic universes continue to dominate the minds and wallets of moviegoers worldwide, it’s weird that there’s only one noteworthy superhero movie starring a woman—and it’s the one that takes place in the miserable nightmare of World War 1 and ends with its titular character brutally murdering her half-brother after harnessing the power of love. This is where the Marvel Cinematic Universe (MCU) formula of laughing at everything and being playful proves useful, with Captain Marvel being a more accessible superhero movie for little girls than the good but tonally inconsistent Wonder Woman. However, it should be noted that Carol Danvers’ (Brie Larson) first flight doesn’t get to its destination unscathed. An initial concern I had was that Captain Marvel would be another origin movie about an underdog turned badass. Granted, it’s a Phase 3 movie so it thankfully forgoes the pedantic formula of showing the titular character’s entire life and instead relies on creatively trippy flashbacks for exposition. My fears proved unfounded because strangely enough, Carol’s introductory movie had more in common with a sequel, namely Guardians of the Galaxy Vol. 2. Similar to Mary Poppins’ introduction into the MCU, Captain Marvel starts with uneasy footing, unsure of how to be an MCU space epic. To introduce the Kree society that Carol has been chilling with before the movie begins, Captain Marvel assaults audiences with a barrage of action scenes, characters, ideologies, jokes, and world building in the opening 10 minutes. The cast is talented and there are humorous moments, but they feel restrained by a script that would be easily mistaken for a direct-to-video Sci-Fi movie filmed in some hack-frauds’ warehouse. Characters’ relationships with Carol are tenuous at best, with them saying that she’s the best person they ever met instead of actually showing why she is. The only exception is Nick Fury (Samuel L. Jackson), who shares a compelling rapport with Carol in what is essentially an MCU buddy-cop movie with ‘90s references, a green Ben Mendelshon, and a fat cat. But like how the Guardians’ second outing grounds itself after landing on Planet Kurt Russel, Captain Marvel stabilizes when it gets to Earth. What lies underneath a seemingly standard superhero adventure is that Marvel movie with something important to say, continuing an upward trend that is now best exemplified by Black Panther. Despite its promotional material featuring lots of space explosions and violence towards the elderly, Captain Marvel never shied about being a power fantasy made for girls and women who are young at heart. What some may not expect, though, is how it goes beyond expectations and delves into deeper territory that other blockbusters films would normally shy away from. Captain Marvel gives girls a superhero they can project themselves onto in the way that old-school superheroes used to do before idiots thought being nice was a sign of weakness. What defines Carol as a heroine is how impulsive, reckless, and prone to mistakes she is, making her more human than a forced paragon of virtue. Contrary to what some say, Carol isn’t bratty—she’s defiant. 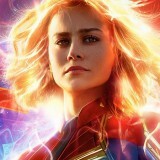 As online trolls trash the female-led Marvel movie because its star dared raise a point, Captain Marvel stands as a super-powered embodiment of female anger and emotion that’s been dismissed by those who fetishize “facts and logic” despite (emotionally) losing their minds at the sight of a woman in pop culture. I found Carol’s blatant disregard for self-righteous authority fun, but I have a feeling that this will be cathartic and empowering for female viewers. By embracing the potential of well-made power fantasies, Captain Marvel tackles themes of conformity, politics, racism, and sexism in ways that only superheroes can get away with (i.e. violence). The best (and most surprising) thing about Captain Marvel is how it flips certain expectations and character interpretations for dramatic effect and topical relevance. Without spoiling, let’s just say there’s a lot more to the alien wars and cat jokes than initially expected. Given today’s miserable political climate, it’s refreshingly bold of Captain Marvel to pick a clear side. The subtext is as subtle as The Purge: Election Year’s hatred of Right-wing America and its messages are often undercut by ill-timed punchlines, but the fact that a Marvel movie said what it wanted to say on a normally apolitical blockbuster platform is in itself a feat. While I’m more enamored by its messages than its delivery, Captain Marvel is still a good superhero debut and a nice throwback to a more innocently inspiring time for comic book movies. It’s clunky and awkward in areas, but the sincere sum of its parts makes the first female-led MCU movie a fun ride with a purpose. Captain Marvel is a great step forward for the MCU, and hopefully it stays the course. Captain Marvel opens in cinemas tomorrow, March 6, 2019 in regular and IMAX presentation.